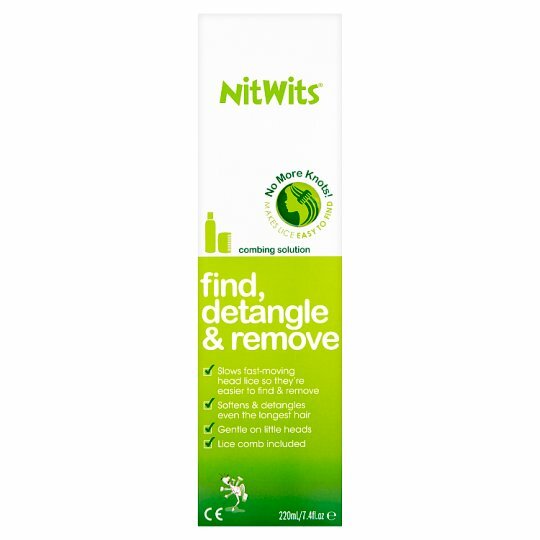 NitWits Combing Solution helps make the task of checking for head lice much more pleasant for mums and kids. NitWits 3-in-1 Head Lice Comb makes combing out lice so much easier with detangling teeth, lice comb and 5x magnifying glass. Get kids back to school the next clay with NitWits All-In-One Head Lice Solution. No mess, no fuss and no rigorous combing. Apply generously ensuring hair is thoroughly coated. Tip: Check the back of the neck and behind the ears as lice will often hide here when disturbed. Divide hair into 4cm sections and using the lice comb included, comb through from root to tip. Continue combing until all hair has been checked. If no lice are detected, rinse hair thoroughly and shampoo hair as normal. Repeat this check once a week as early detection will limit the spread of head lice. If lice are detected during combing, wipe lice and eggs off the comb and onto a tissue. Continue combing until the hair appears clear of lice and eggs. To ensure the head lice life cycle has been broken, repeat this process in 7-10 days to target any undetected eggs. Alternatively treat with NitWits All-in-One to kill lice and eggs in one go. CAUTION: For external use only. Avoid contact with eyes. If contact does occur, flush with water. Before treatment perform a patch test on a small area of the scalp following the directions for use. If after 24 hours there is no adverse reaction, proceed with full application. Do not use on children under 2 years of age without first seeking medical advice. If irritation occurs, discontinue use.